So if you're a pair of outlaw senior citizens in the 22nd Century, and after years of loneliness you fall in love all over again, what do you do? You could go on an interplanetary honeymoon to Mars, get yourselves rejuvenated on the side, and try not to get arrested -- or killed. Meanwhile, your kids back on Ceres are leading a Space Scouts expedition to a strange new planetoid, where a troubled youth from Terra learns a valuable lesson. 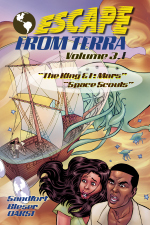 The thrilling adventures of life in the belt continue in volume 3.1 of ESCAPE FROM TERRA!